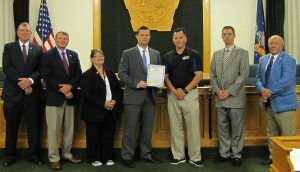 OSWEGO – The Oswego County Legislature proclaimed October 1 to 7 as “Super DIRT Week” to mark the third year of the NAPA Auto Parts event in the Port City. The race originated in 1972 at the “Syracuse Mile” raceway at the New York State Fairgrounds. What began as a three-day racing experience has expanded to a week-long spectacular which runs over Columbus Day weekend every year. Nearly 35,000 fans and more than 300 competitors will converge at the Oswego Speedway for New York’s biggest dirt track racing event. For tickets and details, call 844-347-8849. The Legislature’s Economic Development and Planning Committee presented the proclamation. Pictured from left are legislators Paul House, District 8; Roy E. Reehil, District 5; Mary E. Chesbro, District 10; Committee Chairman Tim Stahl, District 20; Jeff Hachmann, director of events for the World Racing Group; Committee Vice Chairman Shawn Doyle, District 3; and Morris Sorbello, District 23.